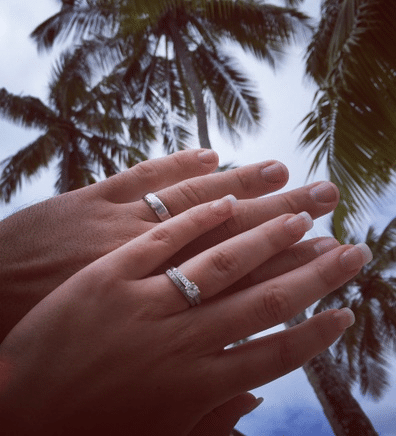 Welcome to another segment of Destination Wedding Advice with Kyle and Carmen! If you have missed the parts, don’t forget to check Part 1 and Part 2! 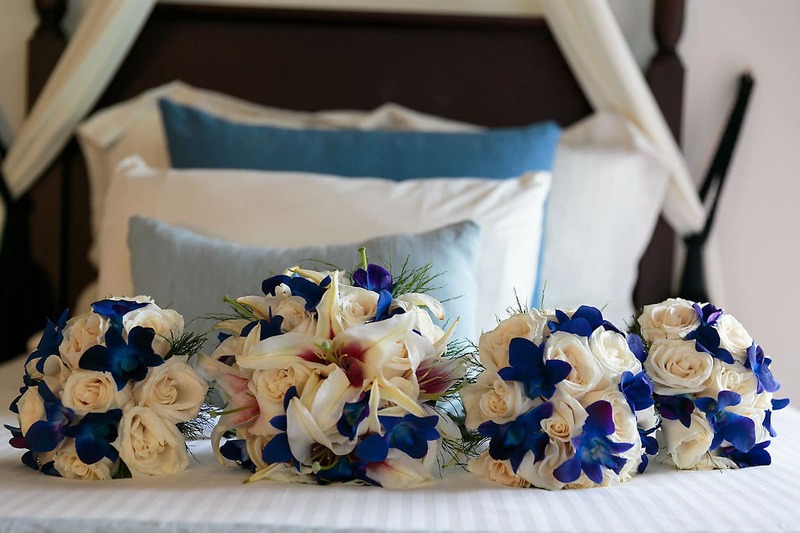 Today, we Destination Wedding Advice – Wedding Day. The lovely Carmen will be talking about the prep for her special day. So, let’s hear all about it! I honestly had a hard time getting sources of information for weddings at the resort. 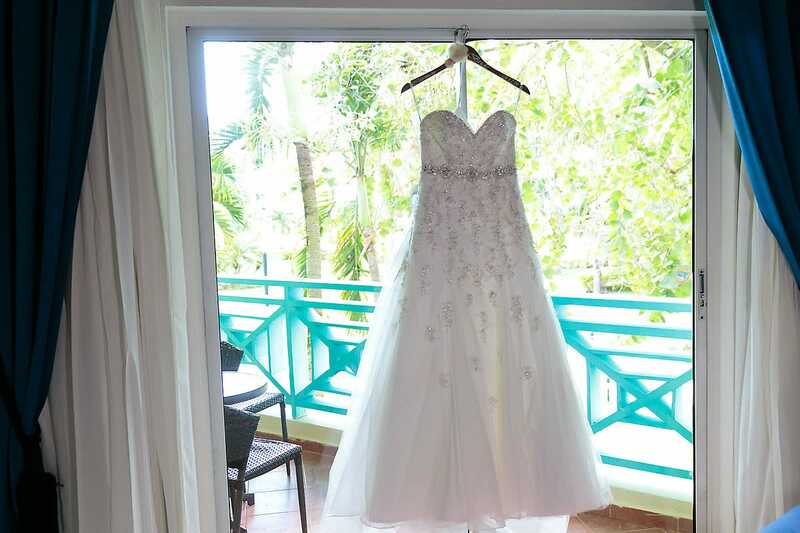 There were a few reviews on places like forums, TripAdvisor, and the ‘Dreams La Romana Brides’ Facebook group. However, most were old with no updates. 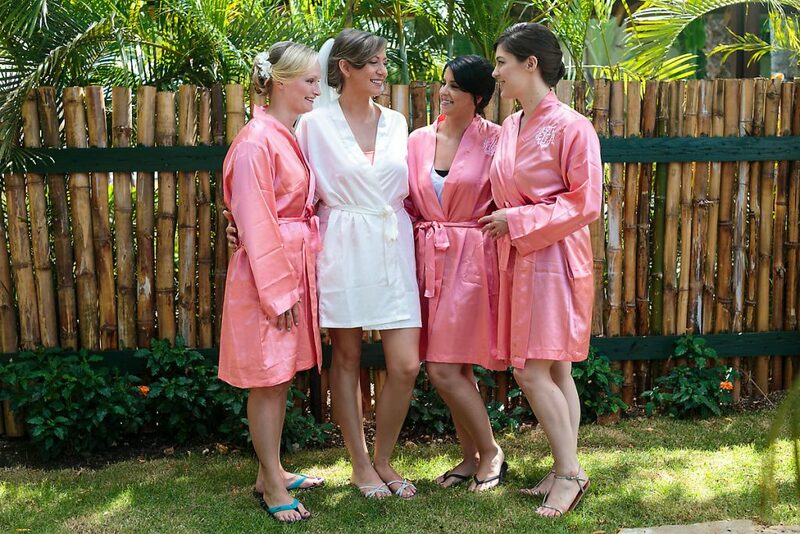 The wedding coordinator at the resort answered many questions throughout the process. However, they certainly know what they’re doing, and everything turns out fantastic no matter how much you stress about it! The wedding day itself was honestly perfect, and I wouldn’t change a thing! Myself, my bridesmaids, my mom and mother-in-law all went to the salon at noon to start hair and makeup. All of us got to hang out drinking mimosas and relaxing while the estheticians made their way through all of us. They were excellent, although spoke very little English, which made communication difficult of course, all was fine as I had pictures of what I wanted for the bridesmaids and me. The eyeliner they used started to run quite quickly, so I had to redo with some of my own, and my hair wasn’t quite right, but my photographer was able to translate and describe what was wrong with the girl doing my hair, and she fixed it, and it still turned out great. 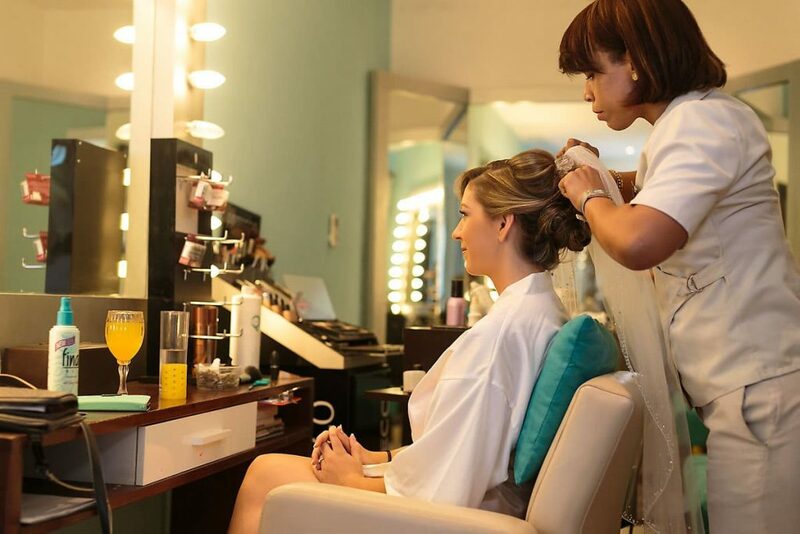 The clips did start to fall out during pictures, so just a reminder to brides to check their hair and makeup in between, as it can be quite a whirlwind and you forget these things. I hired the photographers Julia Eskin and Mark Sergienko (Julia Eskin Photography), the best decision I made for the entire wedding! They are a beautiful couple who have lived and worked in multiple countries and now reside in Punta Cana, and they are truly wonderful people and amazing at what they do. Everything with them was very relaxed, and I’m beyond ecstatic about their work. While Julia was with us in the Salon, Mark went off with the boys to do whatever boys do before a wedding. I also had a videographer from the resort that was there for getting ready and the ceremony, and he was lovely to work with as well and seemed to coordinate well with the photographers. 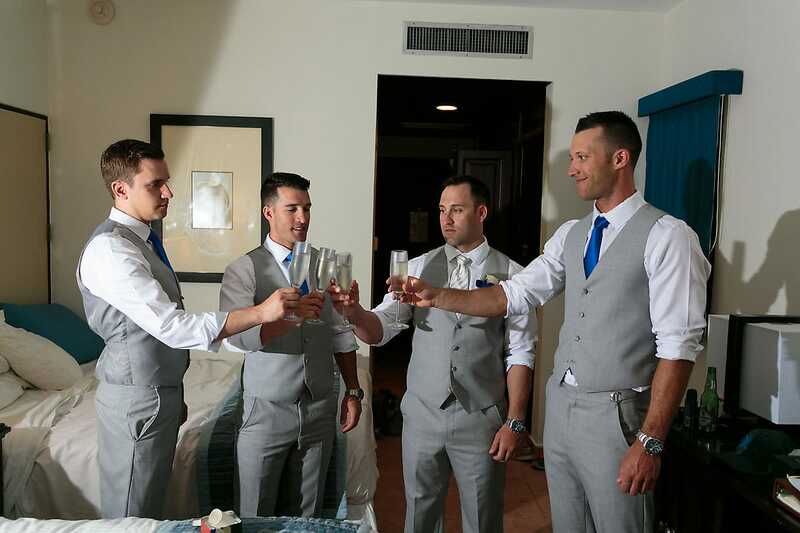 I did make it very clear that the photos were my priority, and I didn’t want the videographer getting in the shots during the ceremony or to have him in our faces for the vows, as I’d read other brides had trouble with that at the resort. I made sure both the wedding coordinator and the photographers were clear on that, and there were no problems. After the salon, we took a few photos in the charming garden outside the spa and then made our way back to the room to get dressed. I had a pretty easy time finding my perfect dress. I took a day about eight months before the wedding and met my mom and bridesmaids in New Westminster. I had a few appointments at a couple of different places. However, I went into Lisa’s Bridal Salon first, and my dress was the second one I tried one. It was love at first sight. Although I continued trying on probably 30 more dresses throughout the day, just in case, I couldn’t stop comparing them to THE dress, and knew it was the one. 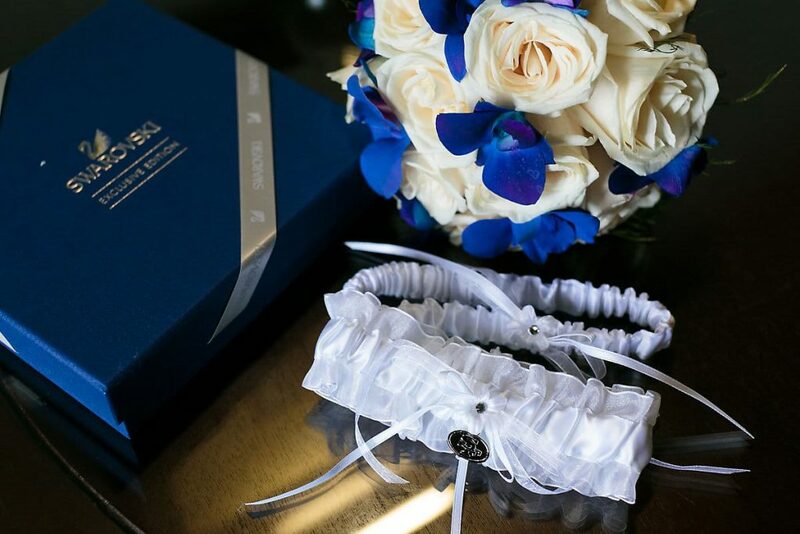 I can’t give enough praise to Lisa’s Bridal for their excellent customer service, which no other shop came close to being comparable, in my experience. Since I was coming from Vancouver Island, they made arrangements for me to come over when the dress arrived, and I was able to get it fitted on a Thursday evening. The seamstress worked on it all day Friday, and I got to try it on and leave it the next morning. Unbelievable work and service, and I was so grateful. Especially, being from out of town, that I didn’t have to make a bunch of separate trips over. 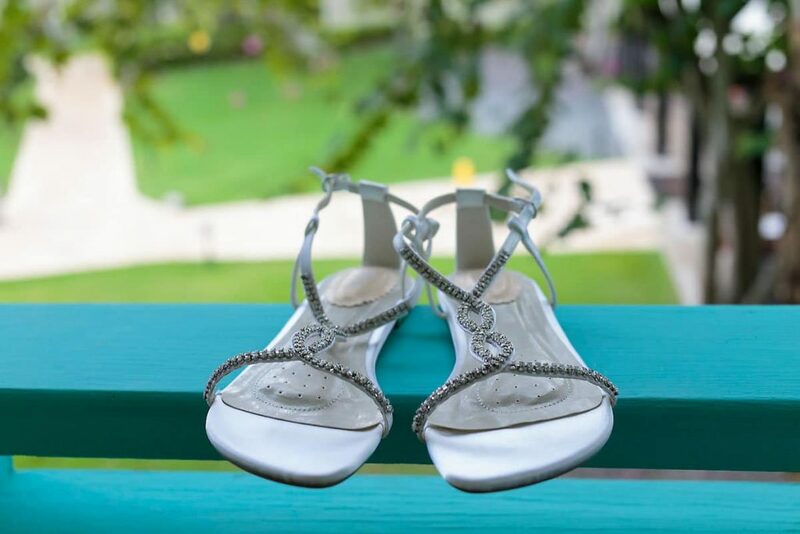 As for the shoes, I wanted something dressy but sandal-like for the tropical destination, and I found the perfect ones from the Dessy website. I ordered them, and they arrived at my house two days later and fit perfectly! Flowers were also an easy pick for me! I went with three of my favourites: white roses, blue orchids, and pink Stargazer lilies. I also brought three charms with me, with photos of my parents on their wedding day. Along with pictures of each of my grandparents. 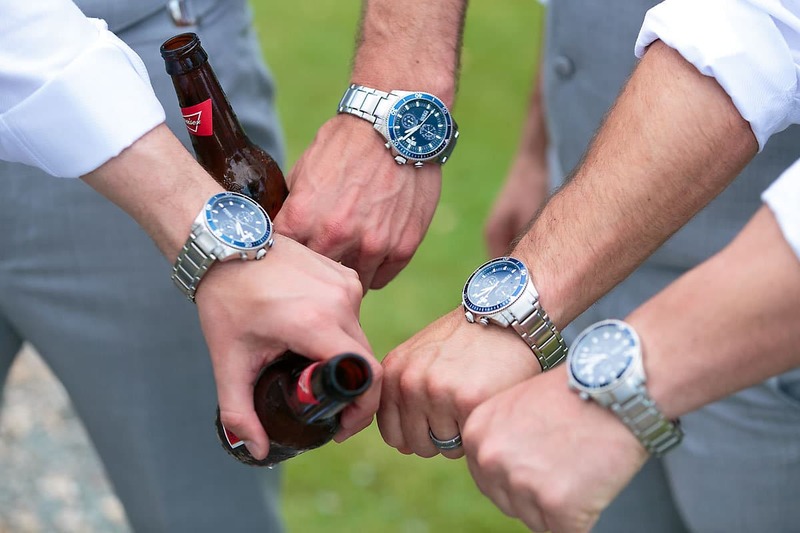 It was a lovely way to feel like I had a piece of each of them with me on my wedding day, as none of them could attend. Kyle had bought my engagement ring two years ago at Lugaro Jewellers, and I was set on getting the matching band. When we went to pick it up, we also found the perfect one for Kyle! I got my necklace and earrings from Swarovski and my Sapphire bracelet as my ‘something blue’ from People’s Jewellers. My childhood dance teacher and a now great friend also surprised me the day of the wedding with one of her grandma’s rings. This was also a Sapphire and worked perfectly as my ‘something borrowed.’ Of course, it also worked as ‘something old’, along with the old wedding photograph of my grandparents. Obviously, my dress (and pretty much everything else) was my ‘something new’! Kyle has always been a San Francisco 49ers fan! So, we put little 49ers charms on both my garter and his boutonniere! I got my girls their earrings and necklaces for the wedding day from Swarovski. Also, for something more personal, I made them all beaded bracelets with Larimar. Consequently, a stone that is exclusively found in the Dominican Republic. with blue faces, matching our wedding colours, that they all wore on the big day. 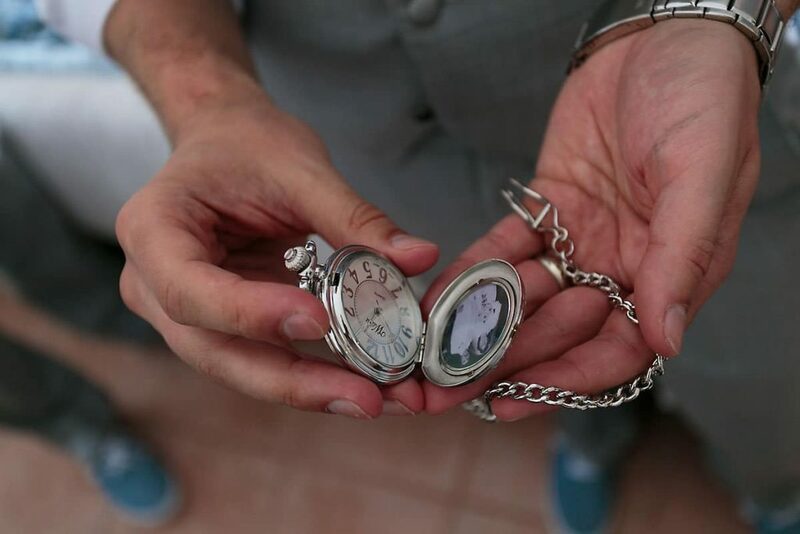 For the same reason, I got him an engraved pocket watch with his parents’ wedding photo inside. Wow! Thank you, Carmen! Stay tuned for next week! Last week will be the last edition with details about the ceremony and reception. We can’t wait to hear all about it. 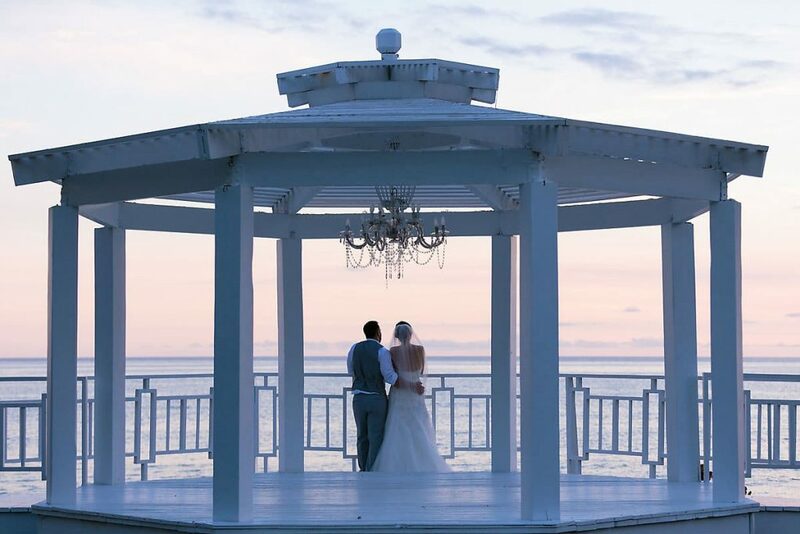 That concludes, Destination Wedding Advice – Wedding Day.